Excellent. If that’s typical of the de Groot then I must get hold of it. How odd that British readers should find it odd for a character to be sent to Australia to make a new start; Dickens did it all the time. This reaction says far more about British expectations of Australian fiction than it does about your novel. I think it’s more that they think they’re reading one kind of book and then it becomes a quite different one, and for some that transition is a bit jarring (though it’s meant to be). And yes: I’m certainly planning to seek out the de Groot now (the quote was sent to me by somebody who’s reviewing it, so I’ve yet to read it myself). 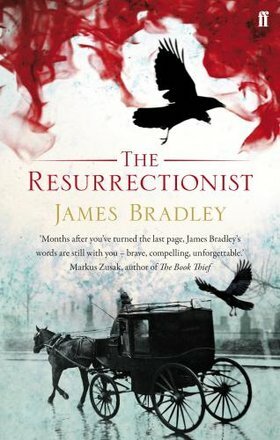 As one of those pesky immigrants, I was able to imagine ‘The Resurrectionist’ through English as well as Australian eyes, and you’re right about that reaction. It relates perhaps to the profound insularity of the British, so drunk with love for their own ‘fabulous’ landscape and history that they find it hard to imagine different worlds. Australia, especially, is the ultimate faraway place for them, even today. It’s an over-the-horizon ‘other’ that’s beyond geography – somewhere people go to escape or be transformed somehow. I’m interested you say that, and I think to an extent you’re right: certainly that sense of Australia as a place of escape and transformation was what the section was all about (I should point out there were plenty of British readers and reviewers who understood what I was trying to do just fine). It’s also interesting both you and Kerryn both pick up on Dickens as well, because there’s a whole, weird, unwritten set of reactions and resonances with Dickens (a writer I’ve been obsessed with for most of my adult life) encoded into the book and the history it uses (all the stuff about imprisonment and escape, Jerry Cruncher, the sketches of St Giles, Magwitch and the nod to Pip in Gabriel’s character, Oliver Twist, which is contemporaneous with the book, Ikey Solomon and Fagin, Ikey Solomon and Tasmania, the thieving of Aboriginal bodies in Van Diemen’s Land, etc etc) all of which are very obvious to me but invisible to everybody else (all books are like that though, like icebergs, or (to use another metaphor) filled with deep wells only the writer can divine). But I’m also reluctant to dismiss the British reactions to the book, because they seem to me to be equally in evidence in the way Australians respond to historical novels. You only have to look at Clendinnen’s attack on Grenville to see a desire to circumscribe the ways novelists can use history (despite her claim she was attempting the opposite) and to control the understandings we can take from it. We tend, in thinking about the way novels use history, to assume there is only one version of the past, and to reduce the discussion of novels to whether they are “true” to that version, instead of paying attention to the ways in which fiction transfigures both past AND present through the ways it appropriates and reshapes historical material. Which is, I think, the point de Groot is making above. And everybody always thinks of Magwitch, but of course Micawber comes to Australia as well, and makes good at last. And the source for Mrs Havisham is buried in Newtown Cemetery. And not one but two of Dickens’ sons emigrated to Australia (one going on to become an MP in the NSW Parliament). For the record, the Australian third is my favourite part of The Resurrectionist. The fact is–especially considering the experiences of my family and the writers in SALTWATER–that an Antipodean ending was for many the best thing that could have happened to them. This comment also applies to William and Constance Kent, about whom I have just submitted a propsal. They may have murdered their half-brother (if not, Papa and the nursemaid did it), but they had lives here that challenge received notions of criminality and redemption. The colonial novel also reflected the trope of emigrant made good, and not just for propaganda reasons. I have just received a glowing review of de Groot’s book, which I commissioned as Reviews Editor of the journal ‘Rethinking History’. He’s on our editorial board actually, but I would have reviewed it anyway, since I think the interface between historians and historical novelists is a crucial area. The review is by Hsu Ming-Teo, who is (like myself) both a historian and a novelist, and she quotes an e-mail from James! Now I feel bad for not saying it was Hsu-Ming who sent me the quote in the first place, but it was. I don’t suppose there’s any chance her review will appear online any time soon? If there is I’d be happy to link to it. Congratulations James, how exciting – and yes, the de Groot book sounds fascinating, from this snippet. Interesting he says you appear to have broken free from your country’s past in ‘The Resurrectionist’ because I think of the English sections as part of your country’s/Australia’s past, as I do the English sections of novels such as ‘His Natural Life’ and ‘The Secret River’. It’s good to see in that last quoted sentence from de Groot such a clear recognition of what you’ve achieved, James, in The Resurrectionist. Alas, writers of historical fiction who don’t ‘keep within their own national historical boundaries’ aren’t always rewarded with such discerning readers. I’m apprehensively conscious of this because large parts of my forthcoming novel The End of Longing (also set in the 19th c.) take place far beyond the boundaries of my own Aust/NZ habitats – in Canada, Japan and elsewhere. Will this be deemed an improper transgression? It’s ironical that a kind of territorial fundamentalism leads some of our historians to try to circumscribe – as you say – ‘the ways novelists can use history’: ironical, because cultural journeying has so fundamentally shaped the consciousness of Australians. Not just transportation, emigration, and all the to-and-fro between Britain and the antipodes, but also, in the late 19th c., a more restless kind of international travel as steamship and rail made so different places accessible. One consequence was that individuals could easily keep moving from country to country without their identity being fully known. This is one of the fascinating things about the divagations of the Kent family, mentioned by Lucy Sussex and traced in Kate Summerscale’s The Suspicions of Mr Whicher. How can a fiction writer evoke the distinctive historical particulars of such situations without taking the story away from home, and giving ‘home’ an itinerant quality? I’m always reluctant to circumscribe what writers can write about, and I’m pretty suspicious of the notion that it’s not acceptable for writers to enter minds from alien cultures, since that seems to lead to an idea of fiction which is extremely narrow. But by the same token I’m keenly aware of the capacity for writers to get it deeply wrong once they step out of familiar surrounds, and of the way assuming you can write as a C14 Japanese woman or a pre-White Settlement Aborigine (for instance) tends to deny the often quite profound differences between cultures and times. I’m not sure I think there is an answer to this problem, other than trying to be sensitive and questioning your own assumptions whenever possible. More interestingly though, I think the increasing global nature of our culture is driving the problem in two directions: one is the sort of globalised fiction of people like David Mitchell (and you, by the sound of it) which assumes it has the authority to move pretty much at will across space and time, and doesn’t feel tied to its creator’s culture. The other is increasing resistance from people whose role has traditionally been to be written about rather than writers in their own right: certainly that’s visible in the fairly hostile reaction of many Indians to a book like The White Tiger. So yes – an interesting question. And I’m now deeply interested to read your book. My comments may have given the wrong impression. I wouldn’t want to share the presumption of authority that seems to drive Mitchell’s bustling and sometimes outlandish mélange of times, places and genres. And I don’t subscribe to any general project of ranging exotically across cultures. (Most of the novel I’m working on currently is set within walking distance of where I live, though in a much earlier period.) So perhaps I was just labouring what may be a mere truism: that, in principle, fiction has every right to move (historically, geographically) beyond its time and place of origin if that movement is integral to the way its characters and situations are imagined – as is so often the case when the writing emerges from an Australian sense that one’s ‘home’ is fundamentally dispersed. I’d like to think that’s obvious, but it may need reaffirming now and then. Orhan Pamuk’s essay ‘Who Do You Write For?’ (in his collection Other Colours) remarks that many readers believe ‘local literatures should remain local’ if they’re to avoid a loss of ‘authenticity’. He argues against this attitude and so would I, especially – for the reasons I’ve touched on – when the context is Australian. Don’t worry: I understood what you meant, and I absolutely wasn’t lumping you in with Mitchell. What I was doing was exercising my own anxieties about my own work, in particular one of the books I’m working on, which is set in Japan in 1946, and makes me deeply uneasy whenever I think about my authority to work with the Japanese characters. But I do think you’re right in suggesting it’s a particularly acute problem for Australians, not just because (as you say) our sense of “home” tends to be dispersed, but because we so often feel the real world is elsewhere.